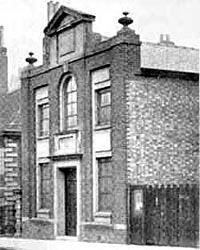 THE Theosophical Hall, Nottingham, recently rebuilt, is a building of very great interest to the student of religious history. 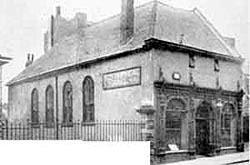 The original building was constructed in 1724 by Mr. Cornelius Launder, who sold it to the Anabaptists (the forerunners of the modern Baptists) for £100. It was the first Baptist Chapel in this district. In 1815 it changed hands and came into the possession of the Scotch Baptists, but not before William Carey’s great missionary sermon was preached within its walls of 1792—a sermon of such power and importance that it led to the foundation of the Baptist Missionary Society. The Rev. William Carey, D.D., was born in 1761, and was of very humble origin. He became a local preacher, a village pastor, and later a minister at Leicester. He went as a missionary to India where he spent forty years in work amongst the natives. In 1792 he attended a conference of seventeen ministers in Nottingham, in the course of which conference he preached the sermon which was such an epoch-making event in religious history.